Typically the shelf life of dried mushrooms is 3-6 months. The Hygrolid system dries, cures and stores your mushrooms at top flavor/potency for a year or longer! Midwest Grow Kit's Hygrolid system comes complete with 1 Hygrolid, 1 Quart storage jar (store up to 20 ounces of dried mushrooms) and 2 silica drying packs. Our Hygrolid system can also be used to store Spore Prints, Herbs, Spices, Tea, Tobacco, Cigars and much more! 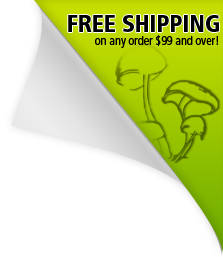 Hygrolid system is the perfect storage solution for your dried mushrooms. Most of our customers end up growing much more than they can consume! There has always been a question on what is the best way to store dried mushrooms so they do not go bad. Our Hygrolid system is the answer! The Hygrolid storage system and the Drying kit both work great. Mushrooms in the Drying Kit are dry in about 24 hours after I first let them air dry in front of a fan for 12 hours. I then transfer them to the Hyrolid which keeps them at the correct humidity. My Ultimate Growing Kit is now producing an amazing amount of mushrooms every day. Simply the best! Midwest grow kits are THE best!!! Hands down. No competition. My new hobby. Product works great and the price is very fair as most prices here. Ships fast. Really is a good way to store my shroomies! I bought one 2 years ago and grew way more than I could use in a year. My friends thought they would be no good after this long, so we tried some, they were still in the same shape they were when I put them in. Well, they worked awesome! 5 star product!! SOOOOO worth the $17! Arrived exactly as described. A necessary item to preserve your harvest. Midwest always provides quick and efficient service.